No. 5 Nebraska (2-1) made short work of Ohio (1-3) on Friday afternoon, sweeping the Bobcats in 67 minutes to open play in the Ameritas Players Challenge at the Devaney Center. Scores in Nebraska’s favor were 25-17, 25-14, 25-17. The Huskers out-hit the Bobcats .349 to .047, out-dug them 38 to 27 and out-blocked them 9.0 to 7.5. Senior outside hitter Mikaela Foecke posted a match-high 17 kills on .593 hitting, committing just one attack error, and she chipped in five digs, two blocks and an ace. Sophomore middle blocker Lauren Stivrins added nine kills on .500 hitting, five digs and a career-high four aces after entering the match with two aces in her career. Senior libero Kenzie Maloney led all players with 11 digs and freshman setter Hames finished with 28 assists and five digs. After bouncing back and forth between sophomore Sami Slaughter and freshman Capri Davis as the second outside hitter in both matches last weekend, Cook gave Slaughter a chance and stuck with her all match. She finished with five kills and two errors on 11 swings (.273 hitting). Slaughter had four kills on 15 swings without a miscue against Oregon last Saturday. After going back and forth for the first several rallies, Nebraska ripped off a 6-0 run with Lauren Stivrins serving that included three aces by the sophomore middle blocker to put the Huskers up 14-8. “Jaylen [Reyes] and Coach [Cook] have really been on me about my serve this week, so we’re just working on getting it more and more consistent and still challenging the other side,” Stivrins said. “Ohio battled back to within two at 16-14 but Nebraska put together another 6-0 run to put the set away and cruised to an eight-point win. The second set was all Nebraska as the Huskers rushed out to a 9-2 lead, then pushed it to 14-4 with a 4-0 run. The Huskers kept the Bobcats at an arm's length throughout the set and an ace by Stivrins on set point sent Nebraska into the intermission with a 2-0 lead. Nebraska out-hit Ohio .355 to .000 in the second set and hit .386 overall through two sets with just three attack errors in each game. The Huskers made short work of the Bobcats again in the third set to complete the sweep as Foecke was too much for Ohio to handle. She racked up seven kills on eight swings in the third set alone. Ohio jumped out to a 7-4 lead early but Nebraska responded with a 10-0 run with freshman defensive specialist Megan Miller at the service line. Nebraska’s lead reached double digits at 23-13 before Ohio made one last push with a 4-1 run. Stivrins finished off the sweep with a kill. 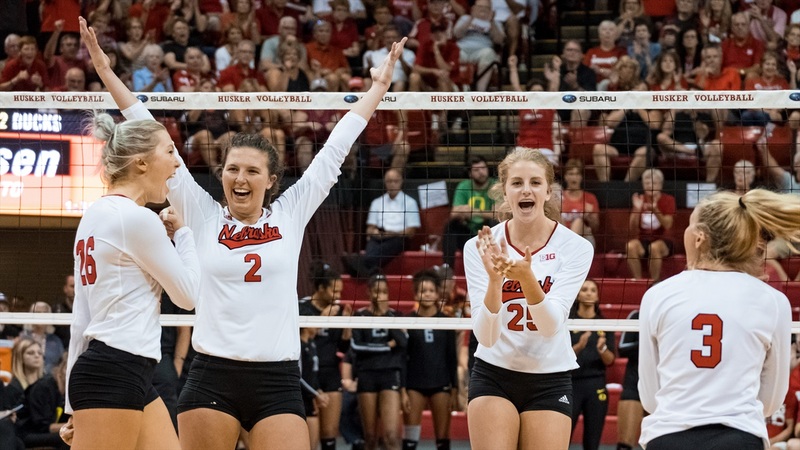 Serving is always a big emphasis for Nebraska and the Huskers finished with seven aces and 10 errors with a pair of new servers leading the way during some big runs. One of the highlights of the match came during the player introductions as Ohio junior outside hitter Carley Remmers, a native of Filley, Nebraska who had a standout career at Freeman High School, was announced as a starter to a loud ovation. Remmers, who has had some unfortunate injury luck during her college career, checked out before the first point. Nebraska will return to the Devaney Center for a nightcap against Wake Forest. The Demon Deacons fell to Santa Clara 3-1 (20-25, 22-25, 25-21, 16-25) in the opening match of the Ameritas Players Challenge. Caroline Rassenfoss led the Deacons with 15 kills while Caitlyn Della and Myca Mitchell had 11 kills apiece. First serve is set for 7:30 p.m., or 30 minutes following the conclusion of Ohio versus Santa Clara.